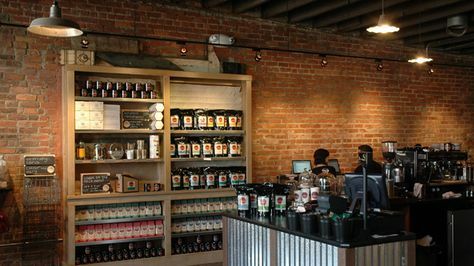 Located in Eastern Market this minimalist coffee shop offers locally sourced American eats and also acts as a art gallery, and live music venue. Small cafe that offers natural and organic coffee alongside house made sandwiches, salads and baked goods featuring a rotating chalk wall by MITM alum. Small multi-roaster coffee shop located inside Savvy Chic in Eastern Market, is a great place to relax and read a book or enjoy conversation with locals. Part coffee shop, part tea and spice shop this family owned joint offers small batch roasted coffee from all over the world in addition to tasty treats and made in Michigan goodies. A MITM staff favorite this wine shop and bar offers regional wines,small plates, amazing live music from house and techno to jazz and one of the best patios in the city. A must when visting Detroit. Small brewpub with a warm vibe that serves brick oven pizza alongside their in house brewed seasonal beers. Serving up amazing coffee and pastries, this airy and bright shop is great for a chill breakfast or afternoon snack. Be sure to check out the Ouizi (MITM alum) mural across the street. Live music venue and bar in Corktown, Detroit’s oldest neighborhood. Enjoy chill vibes, a rotating beer list and New Orleans style cajun grub and handmade burgers. Check out their brunch on the weekends! Live music venue offering sounds from local bands and DJs, to national acts and heavy hitters. Stop in for a cocktail or a beer and chill on the outdoor patio. Detroit’s first licensed distillery to open since Prohibition! Jam to local DJs on Wednesdays, while sipping craft cocktails in a tasting room adorned with rotating local artwork. Iconic Vet bar located in Midtown that has come to be one of the city’s best known and loved dive bars. Cheap drinks, great jukebox, pool table, patio and a wide range of live music from hip-hop to rock on the weekends. Vibrant late-night hot spot garners raves for its high-energy DJs, cocktails & stylish atmosphere.